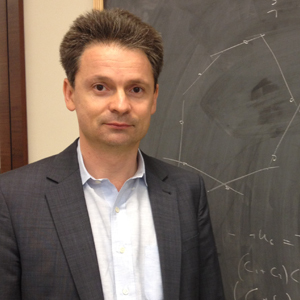 The Simons Foundation is pleased to announce that as of September 1, 2012, its Mathematics and the Physical Sciences (MPS) division will be led by Dr. Yuri Tschinkel, also professor of mathematics at New York University’s Courant Institute of Mathematical Sciences. In 2009, the foundation formally launched its MPS program, which awards grants primarily through competitive, open, application-based procedures and supports mathematics, theoretical physics and computer science. Since then, the MPS division, under the direction of David Eisenbud, has established the Simons Institute for the Theory of Computing, implemented various programs to support researchers in different stages of their careers, and organized and funded symposia and lecture series. It is this young tradition that Tschinkel inherits as he succeeds Eisenbud, who will soon be director of the Mathematical Sciences Research Institute in Berkeley, Calif., and is of late a board member of the Simons Foundation. Prior to joining the Simons Foundation in 2012, Tschinkel was on the faculty of the University of Illinois at Chicago, a visiting associate professor at Princeton University, the Gauss chair of mathematics at the University of Göttingen, and professor and chair of the mathematics department at the Courant Institute, New York University. He was also a member of the Institute for Advanced Study in Princeton and held visiting fellowships at the Isaac Newton Institute for Mathematical Sciences in Cambridge, Tokyo University, the Max Planck Institute in Bonn, the Institut des Hautes Études Scientifiques in Paris, the Eidgenössische Technische Hochschule Zürich, and the Research Institute for Mathematical Sciences at Kyoto University. He was an invited speaker at the International Congress of Mathematicians in Madrid in 2006. Tschinkel studies higher-dimensional algebraic varieties, their hidden symmetries and rational points. He received his Ph.D. in mathematics from the Massachusetts Institute of Technology in 1992. From 1992–95, he was Junior Fellow of the Harvard Society of Fellows, and from 1995–96, he was a Leibniz fellow at the École Normale Supérieure in Paris.